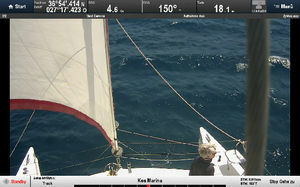 Today spontaneously I changed my schedule as light winds easily allowed to go North. 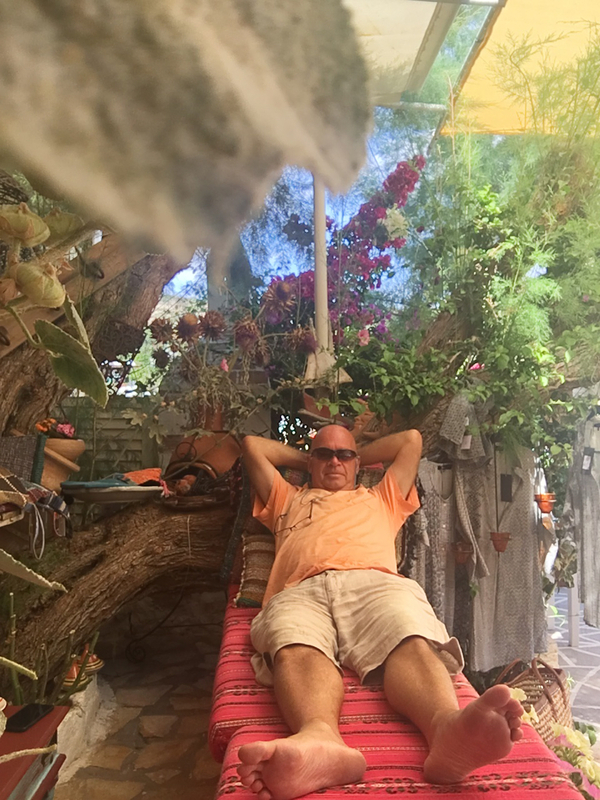 Faliraki Cafe invites for relaxation. 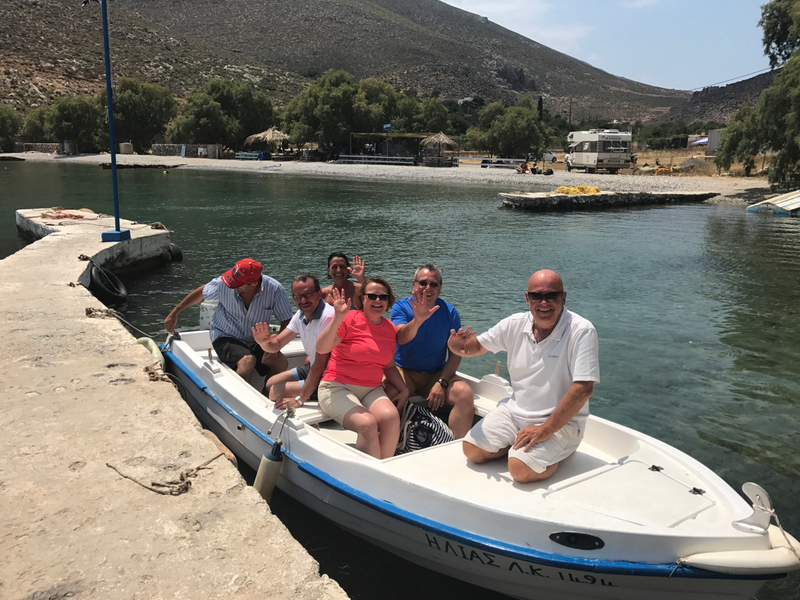 After a weekend with strong winds we used the calm weather today for a day trip to lovely Palionissos. With my friends Angela, Maria, Gianni and Rüdiger we had great food and a nice swim. 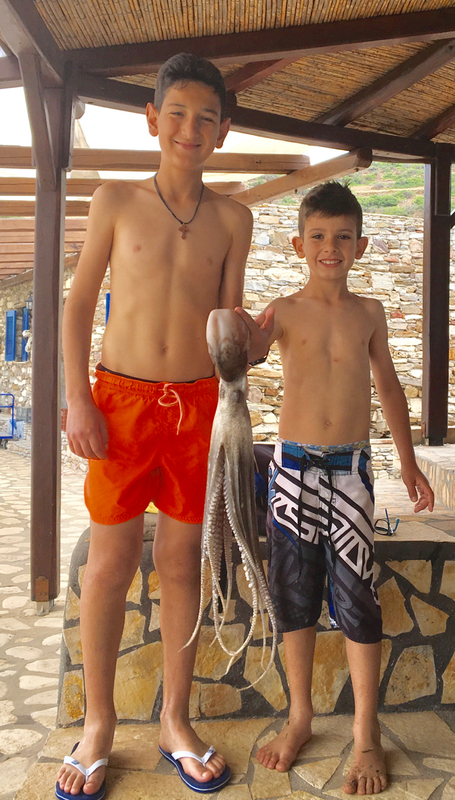 2 young boys caught an octopus while we were having lunch at the Pirate Taverna in Marathi. When we arrived in Arki today there was only one place left, where we could moore. 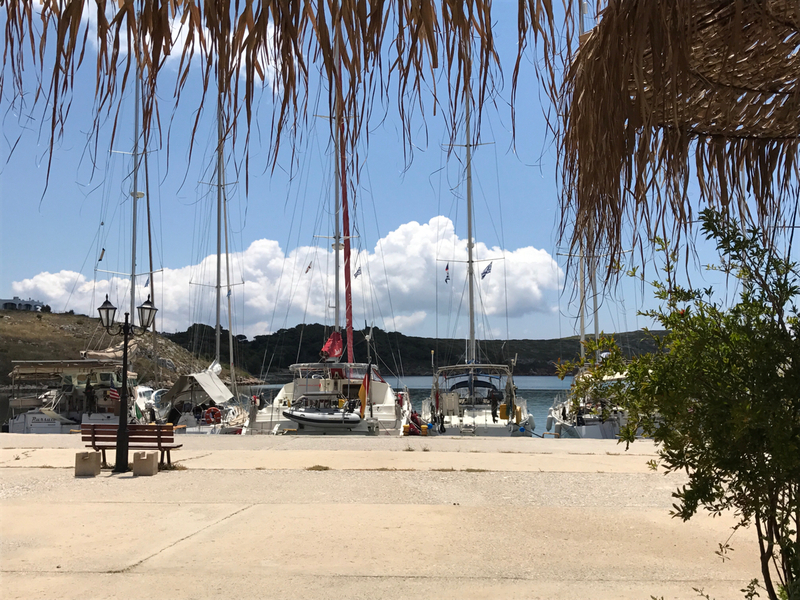 Our short weekend trip was without any fuel consumtion: on Saturday with light southerlies downwind north to Palionissos and on Monday with force 4 to 5 NW back to Kos. 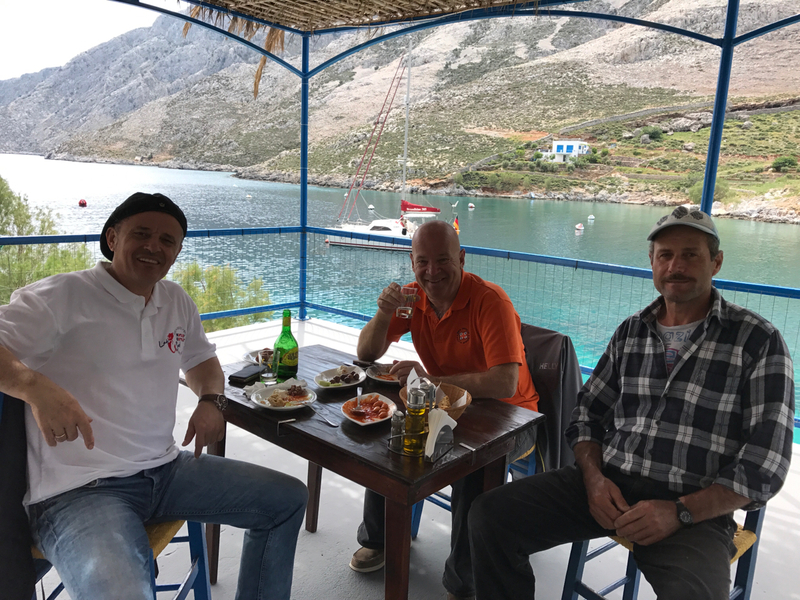 First the good news: Ilias Taverna in Palionissos on Kalymnos now has got a new internet connection via satellite that is also available to their customers. After arrival today with a nice downwind sail with southerlies from Kos I had to reconfigure the new network to have a separate customer and owners network. 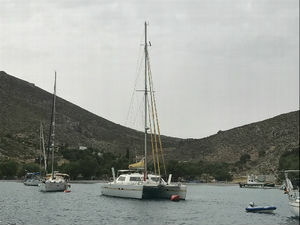 While working on that, someone was screaming through the bay and we finally realized, the the other catamaran went off his mooring buoy and was already at the rocks. So everyone went into their dinghys and tried to push her off to the sea. I finally jumped aboard, started the engines and took her back to the mooring buoy. 7 crews were involved in the rescue operation plus Christos and Kostas from the taverna. So it was time for the first swim of the season in 20° C water. Toni joined me for my first trip in 2017. On our way to Palionissos I was stopped for the first time in my life by a Frontex boat, the European border control. Very nice and polite people I have to say. They just asked us, where we were going, that's it. In Palionissos we we had a very hearty welcome by our friends Nomiki and Christos, and of course a great meal featuring meze and a lemon Sepia risotto. For everyone wondering, why this post is in English: from this year on I will post in English as I have a lot of non German speaking followers.